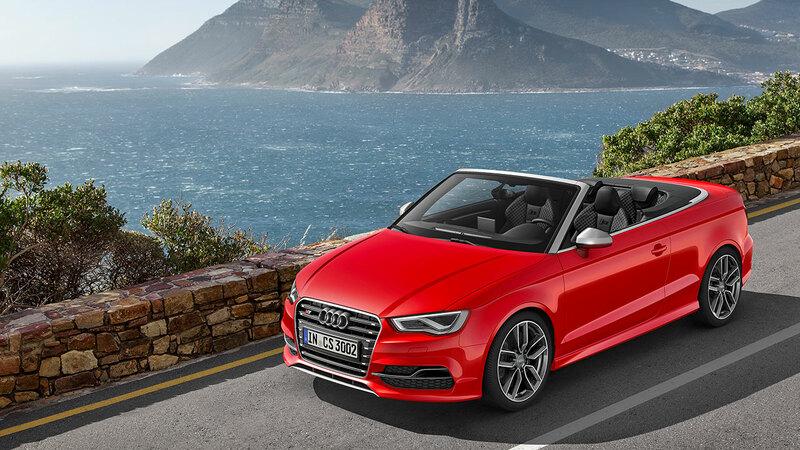 An exhilaratingly fresh approach to open-air motoring comes courtesy of Audi next month with the first ever convertible Audi ‘S’ model in the premium compact class. 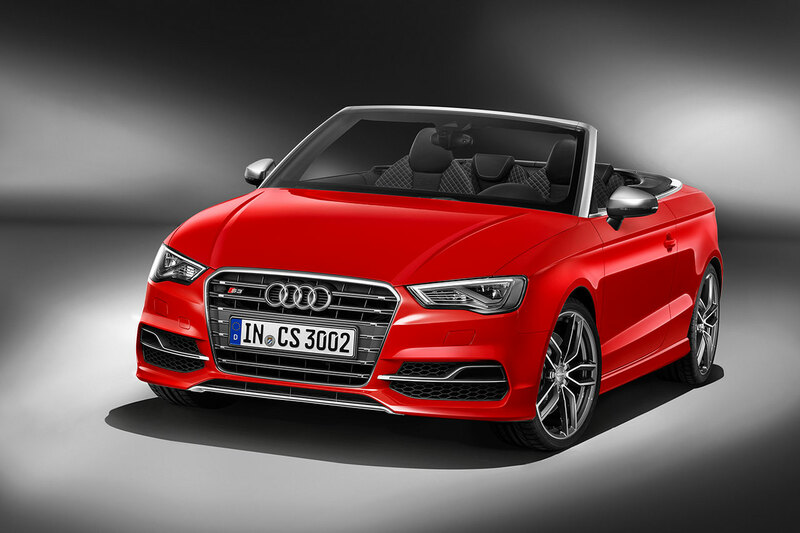 The all-new, 300 PS S3 Cabriolet will star at the Geneva Motor Show, and UK orders are set to start in April. First customer deliveries are expected to commence from July. 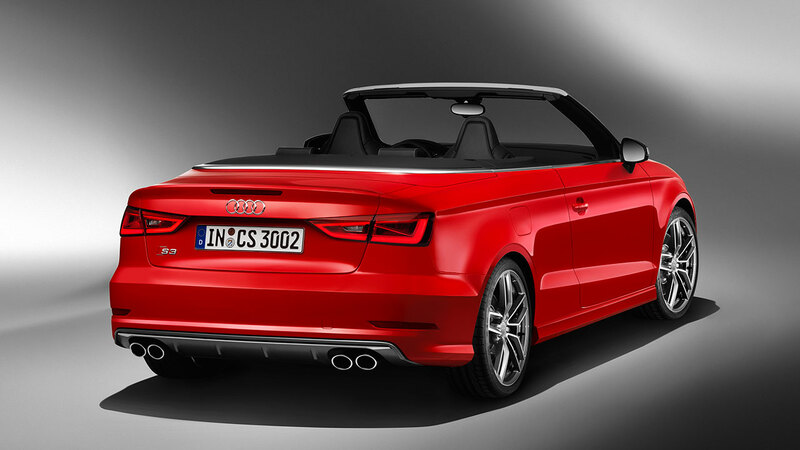 From a visual standpoint alone, the Audi S3 Cabriolet cuts an athletic figure. It is 4.43 metres long, has a wheelbase of 2.60 metres, and is 1.79 metres wide and 1.39 metres tall. The proportions are extended and balanced elegantly; precise lines and muscularly arched surfaces define the flanks. The open-top four-seater has a soft top with an electrohydraulic drive. Magnesium, aluminium and high-strength steel keep its weight low. A highly insulating foam layer in the roof reduces the noise level in the interior. The top is available in three colours. It opens or closes in 18 seconds, even while driving at speeds up to 31 mph. An active rollover system protects passengers in the event of an accident. Many design details hint at the engaging driving potential of the open-top four-seater. The Singleframe grille, surrounded by a chrome frame, features a platinum-grey insert and double cross-struts with an aluminium look. The air intakes are framed by powerful edges and filled with double ribs and honeycomb inserts. S3 badges adorn the front and rear. The 10 paint colours include the exclusive Panther Black, crystal effect. Aluminium strips on the windshield frame and beltline, aluminium-look exterior mirror housings and edged sill trims define the sides. The taillights are equipped with LEDs as standard. The luggage compartment lid has a spoiler edge, and the bumper has been redesigned. An aluminium-look bar and four vertical ribs give shape to the platinum-grey diffuser, which frames the four tailpipes typical of Audi S models. 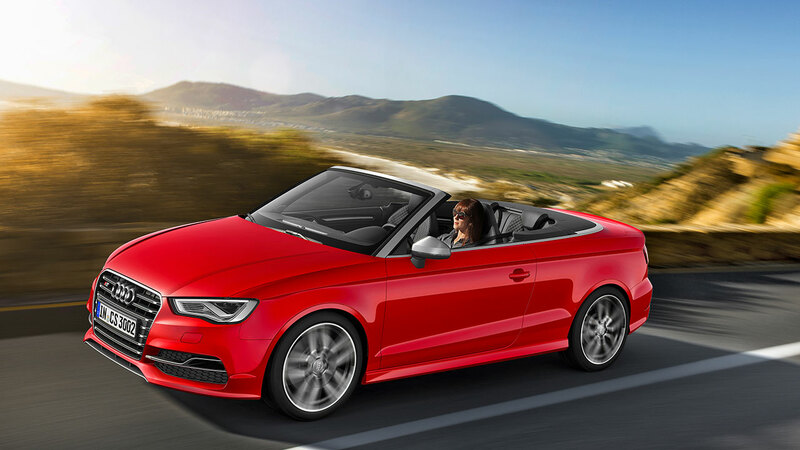 The Audi S3 Cabriolet is powered by a 2.0 TFSI which delivers 300 PS between 5,500 rpm and 6,200 rpm and produces 380 Nm (280.27 lb-ft) of torque from 1,800 to 5,500 rpm. With S tronic the open-top four-seater accelerates to 62 mph in 5.4 seconds. The top speed of 155 mph is limited electronically. When empty (without the driver), the Audi S3 Cabriolet weighs just 1,620 kilograms. The passenger compartment consists primarily of ultra-high-strength steel, and the bonnet is made of aluminium. The turbocharged 2.0 TFSI, which displaces 1,984 cc (bore x stroke 82.5 x 92.8 millimetres), is a true performance engine. Heavy-duty aluminium pistons and higher-strength connecting rods transmit the forces to the crankshaft. The aluminium-silicon alloy used for the cylinder head combines high thermal stability and strength with minimal weight. Two balance shafts ensure supremely smooth running performance. When the standard Audi drive select dynamic driving system is operating in dynamic mode, it has a heightened throttle response, and the engine revs up briefly when the S tronic shifts gears. The sound flaps in the exhaust system open as the load and rpms increase. The turbocharger provides charging pressures of up to 1.2 bar, and a powerful intercooler greatly reduces the temperature of the compressed air. The so-called drumble (swirl and tumble) flaps direct incoming air in a targeted manner. The camshaft can be offset by 60 degrees relative to the crankshaft on the intake side and by 30 degrees on the exhaust side. In addition, the Audi valvelift system (AVS) regulates the valve lift in two stages. Despite the engaging performance, the Audi S3 Cabriolet with S tronic will return up to 39.8 mpg combined, equating to 165 grams of CO2 per km. The technologies from the Audi modular efficiency platform contribute to this impressive figure. Of particular interest here is the additional indirect injection into the intake manifold, which replaces the petrol direct injection FSI in the part-load range, where it lowers fuel consumption and particulate emissions. In the standard six-speed S tronic transmission, the bottom gears are close-stepped for a sharper response, whereas the long gear ratio of the top gear lowers rpm and therefore fuel consumption. The driver can operate the lightning-fast dual-clutch transmission in the automatic D and S modes or take control using the gearshift lever in the touch control gate or the standard shift paddles on the steering wheel. An attractive efficiency function of the six-speed S tronic is the one-way clutch. It becomes active when Audi drive select is in efficiency mode and the driver steps off the accelerator. Synonymous with every Audi ‘S’ model, the S3 Cabriolet also makes use of quattro permanent all-wheel drive – the perfect foundation for optimal traction and driving dynamics in all road conditions. Only Audi offers permanent all-wheel drive in the premium compact segment. Its characteristic strength lies in the enhanced slip-free acceleration, driving dynamics, driving safety and directional stability that it delivers, even in difficult winter conditions. When exiting a corner, it securely transmits its power to the road, while two-wheel-drive competitors have to struggle for grip. In normal conditions, the clutch sends most of the engine’s power to the front wheels. If traction decreases, the clutch can transfer torque continuously to the rear axle by forcing the packages of plates together via controlled action. The chassis with its eager, precise response and high stability brings the dynamic quality of the Audi S3 Cabriolet to perfection. The axle load distribution is superbly balanced at 56:44; the rear-inclined installation position of the engine contributes to this, as does the front axle situated far to the front. Both solutions are from the Group’s modular transverse platform. The subframe and pivot bearing on the front suspension are made of aluminium, and a four-link structure is used for the rear axle. 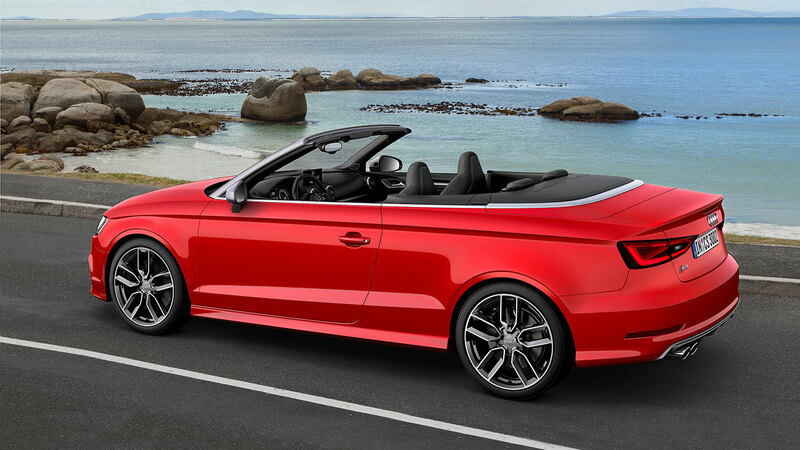 Compared with the Audi A3 Cabriolet, the body is 25 millimetres lower due to the S Sport chassis. With the standard progressive steering, the rack-and-pinion is designed such that the steering ratio becomes more direct with steering-wheel motion – thus agility and comfort complement each other perfectly. The electromechanical progressive steering, which adapts its assistance to the speed, enables various optional assistance systems. Measuring 340 mm in diameter, the front brake discs are very large, with black – or optionally red – calipers emblazoned with S3 logos. The electromechanical parking brake is integrated into the rear brake system. The electronic stabilisation control (ESC) manifests itself in a new stage of evolution. Before reaching the handling limits, a finely metered braking torque is applied unnoticeably to the inside front wheels. This improves the car’s agility and complements the work of the quattro drive. The standard Audi drive select dynamic driving system controls the engine, transmission and steering assistance characteristics, as well as the S tronic. The driver can select comfort, auto, dynamic, efficiency or individual mode. Draped completely in black, the interior of the S3 Cabriolet has a clean, elegant appearance. As with every Audi, its operation is easy and the finish is of superior quality. There is room for two adults in the rear, and the front seats feature an easy entry feature for convenient access to the rear seats. The 285-litre luggage compartment can be expanded by folding down the rear seat backs; its volume is 245 litres when the top is down. Fine details emphasise the dynamic character of the open-top four-seater. The standard inlays are made of matt brushed aluminium, and many of the controls gleam in an aluminium look. The instrument dials are in S-specific dark grey metallic and the digits and needles are white. A three-dimensional S3 logo and a boost pressure indicator complete the tachometer. The colour driver information system is standard; the power-retractable on-board monitor powers up to display a special S3 screen. The S sports seats guide and support the body, and the backrests have embossed S3 logos. The upholstery is finished in Fine Nappa leather with S embossing and contrasting stitching. Combinations of Alcantara and leather are available as options. Alternatively, the Parade red design package offers pronounced upper shoulder sections and door trim inserts in Parade red with contrasting stitching. A special colour pigment on all leather trim prevents seats from heating up too much in the sun. A leather multifunction sport steering wheel is standard with a flat-bottomed rim and shift paddles. Other standard features are the pedals made from brushed stainless-steel. The aluminium door sills bear S3 logos. Other standard features include heated front seats, Xenon plus headlights and the storage and luggage compartment package. The range of available options is also highly attractive and includes head-level heating in the front seats, LED headlights and the advanced key, to name just a few. MMI navigation plus with MMI touch and a high-resolution seven-inch monitor top the infotainment range. The supplementary Audi connect module delivers the brand’s customised Internet services to the car using the fast LTE standard. The Bang & Olufsen Sound System ups the ante with 13 speakers. Rest recommendation is equipped as standard, and customers can choose to equip a host of other optional driver assistance systems including adaptive cruise control, Audi side assist, Audi active lane assist, park assist with selective display and the Audi pre sense safety system.